From Terrell Buckley to Deion Sanders, Florida State is widely known as a defensive back factory. With recent first-round draft pick Jalen Ramsey (2016), the storied tradition of the Seminoles DBs lives on. With its lasting legacy, it is expected that they produce high end NFL talent on the back-end of their defense yearly. 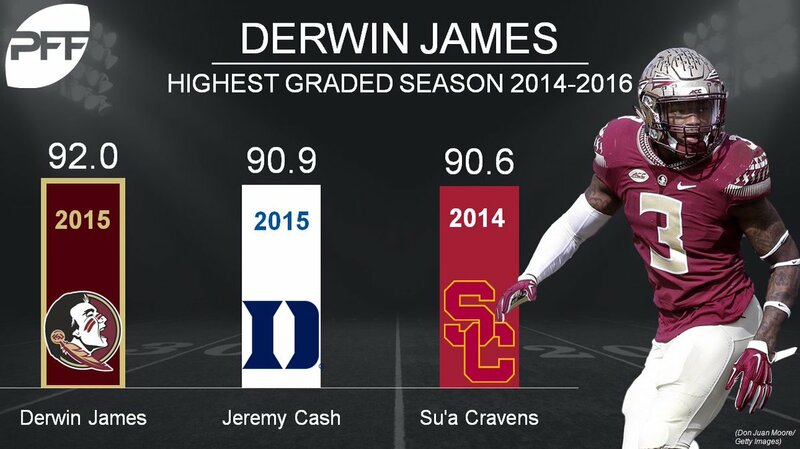 That belief holds true this year with safety Derwin James. A highly touted five-star recruit out of high school, James entered Tallahassee with a lot of hype. His freshman season, he lived up to every bit of it, as he finished the season as a USA Today Freshman All-American and All-ACC Third Team selection. Entering his sophomore campaign, there was a tremendous amount of hype surrounding James. Unfortunately, his season was cut short due to a torn meniscus. Looking to rebound from that, lets take a look at some of the strengths and weaknesses of the talented safety entering next season. One of the most impressive traits about James' game is the amount of ground that he's able to cover while in coverage and coming down in run support. He has a fierce mentality of wanting to get runners to the ground with authority. Always playing at 100 mph, James is an aggressor. To this point, he has been primarily used as an overhang linebacker, meaning that he has multiple responsibilities. In the example above, he is the strong safety. Considering that the ball is on the far hash, James is responsible for the biggest area of the field on this particular coverage. The extreme competitor quickly diagnoses that the offense is trying to execute a swing screen to the running back to the field, which is his area. He quickly triggers downhill and executes the tackle. Tackling has become a lost art among many defensive backs in the NFL today. It is hard to find players who can consistently do it. James is one who has proven to be a consistent tackler. While he can be a bit wild with his tackling technique at times, the good definitely outweighs the bad. The Seminole defender makes many highlight plays and his consistent ability to bring down ball carriers is a huge reason for that. A special trait that James does possess is his pursuit angles or routes that he takes to ball carriers. Against Houston, he did a good job of cutting off threats with his pursuit angles. Safeties who routinely take bad angles can turn marginal plays into huge gains for an offense. Arizona Cardinals safety Deone Bucannon is arguably the best present day example of a "hybrid" linebacker. Some players who are labeled as safeties may not have the ability or fluidity to play on the roof of a defense in coverage, and thus are more comfortable closer to the box. The Cardinals star plays all over the place in their defense, but is primarily used as a linebacker. When James enters the NFL, he will be in a similar situation as Bucannon. Florida State uses James in many spots, but he shines when he's at strong safety or the overhang linebacker. Using him on run blitzes off the edge is a prime example of James' impact at this particular hybrid position. After playing just two games last year, James' season was cut short due to a torn meniscus in his left knee. It was believed that he would miss 5-to-7 weeks after getting surgery. That proved to not be the case, as he went on to miss the entire season after injuring the knee against Charleston Southern, the exact play below. James is labeled as a safety, but he is best utilized and seems most comfortable the closer he is to the box. This is not to say that he can't cover, because he's shown to be able to run with slot receivers and tight ends, but that is not when he is at his best. The Florida State defensive leader is at his best when he is in the hybrid linebacker-strong safety role. James is not build like a linebacker, but he has the versatility to play close to the box, and the necessary speed, despite looking more like a safety than a linebacker. As many highlight plays that James has, he is only responsible for three turnovers in his career. Recording only one interception against Ole Miss last season, you would like to see him find a way to create more turnovers.